Will the Bellroy Very Protective Wallet live up to the rigors of outdoor life? Photo: Paul Kirtley. I certainly find this is the case when I’m travelling. I like to have a place for everything and everything in its place. The danger is, of course, that you end up adding bulk and weight to your kit by using organisational items. If you’re not careful, all those stuff sacks, mesh bags, notebook covers, travel document folders, wallets, pouches, etc., add up. So, I’m always on the lookout for streamlining my personal kit while remaining organised. I’d noticed Bellroy advertising their wallets on Facebook. In fact, a friend even posted something about wanting one. I actually did need a new wallet as my old one is falling to bits. I eventually took a look at the Bellroy website. I noted they offered a range of wallets, some of which seemed well suited to travel. Indeed, some of their range is designed specifically for the traveller. Bearing in mind my desire to stay organised but in a minimalist way, I was attracted to the Very Protective Wallet. This promised “wallet protection for the active soul”. 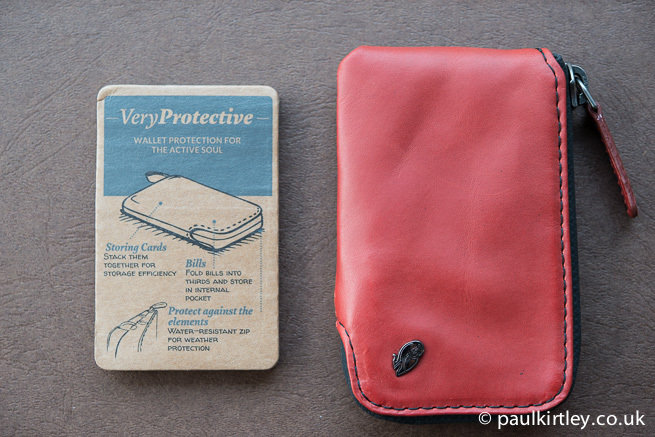 Bellroy Very Protective – Wallet Protection For The Active Soul. Photo: Paul Kirtley. Big promises. But as long as it keeps my cards and cash in good condition, however, I’m happy to look after my soul myself. 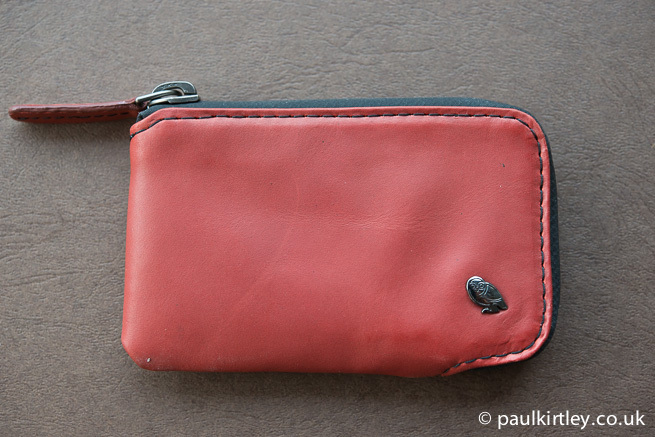 This wallet design seemed a simple affair but there were several things I liked about it. First it was compact, second it appeared to be well-made of good quality materials, third it had a water-resistant zip. Speaking as someone who seems to get bits of birch bark and leaves in their wallet on a regular basis, the ability to seal the wallet contents from accepting this sort of woodland detritus appealed. So I decided upon the Very Protective Wallet and duly ordered one. Available in black and russet, I opted for the brighter colour as I figured, it would be easier for me to notice if I dropped it on the ground or left it somewhere inadvertently. Not that I am prone to losing things. Some people seem to lose wallets, phones, keys, passports all the time. I’ve only ever lost a wallet once in my life and I was fortunate enough to get that back, contents intact. I was wearing a borrowed dinner jacket and I thought I’d slipped my wallet into the inside pocket after paying for a taxi but it had slid down the lining and onto the car seat, where I left it. Otherwise, I put my ability to keep hold of personal possessions down to having a place for everything and everything in its place. I had hoped to receive the wallet before my recent trip to Norway. It would have been a good opportunity to road test the wallet plus, as I mentioned above, my old wallet was on its last legs. As it happened, I had to wait until I returned. The wallet was waiting for me, in a neat little cardboard package. On removal from the packaging, the wallet was indeed very compact – just as I’d hoped. The feel of the leather is quite thick and appears to be of good quality. It has that lovely real-leather smell in abundance. Bellroy leather wallet detail. Photo: Paul Kirtley. Bellroy have not scrimped on the use of leather. 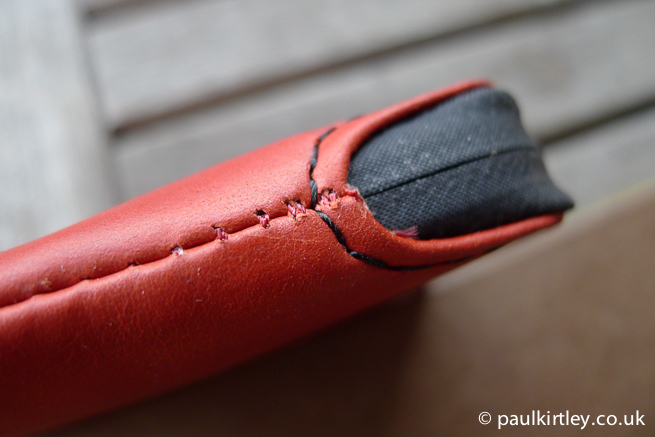 As well as the outer casing there is leather inside as well the zip-pull. There’s also a nice fabric lining inside. Bellroy leathers are vegetable tanned, non-toxic and ethically sourced – another thing which attracted me to their products. They claim their leather “will age much more gracefully than standard surface painted leathers”. Only time will tell but I was happy with the leather out of the box. What disappointed me a little, though, were some of the finishing touches. The stitching wanders a bit and the finishing stitches are a little crude in places. There was glue on the leather pull-tab. Even though the wallet arrives wrapped in tissue paper, the trademark Bellroy owl insignia was really quite scratched and the leather on the front of my wallet had a sizeable curved scuff as if someone with long fingernails had tried to pick it up and failed. 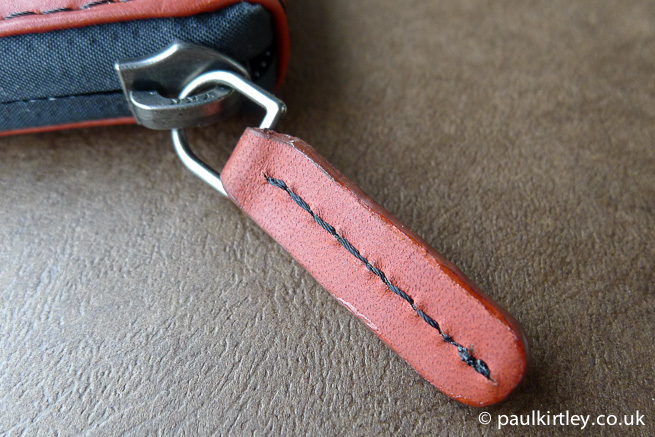 Leather zip-pull detail. Photo: Paul Kirtley. On the wallet I received, some of the stitching could be tidier. Photo: Paul Kirtley. 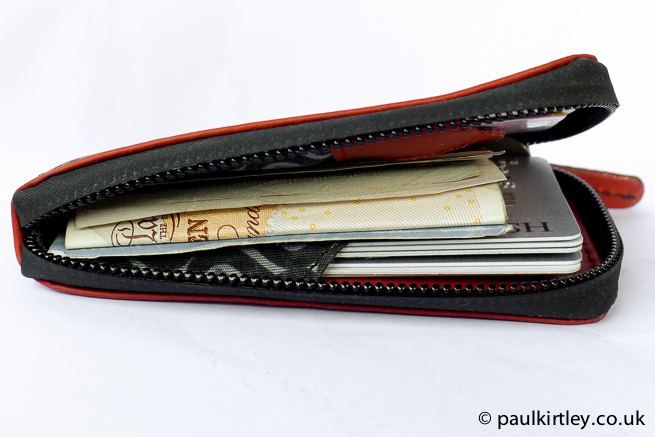 All small points but you don’t get much change out of £50 for this wallet, so my expectations were reasonably high. I have other well-made leather items ranging from watch straps to camera cases to knife sheaths, which serve as a benchmark. The workmanship on this wallet doesn’t quite cut the mustard compared to these. In terms of the superficial damage to the front of the wallet, I suspect the issues lie with the storage or picking and packing of the items at Bellroy’s warehouse. While I’m sure the wallet will receive its fair share of wear and tear as it accompanies me on my travels, it would have been nice for it at least to turn up in perfect condition. 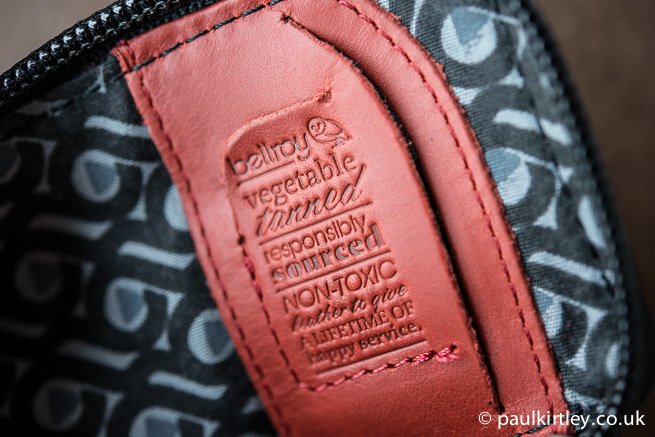 Very Protective interior detail – “Bellroy vegetable tanned responsibly sourced non-toxic leather to give a lifetime of happy service.”. Photo: Paul Kirtley. Those who come to my funeral will be able to attest to the truth of this claim but I’ll be happy if my first Bellroy lasts longer than the average lifespan of one of the many leather wallets I’ve had in the past, which I estimate to be about 3-4 years. The zip, which seems quite chunky in the context of this diminutive wallet, is a decent YKK model, with solid, metal attachments. As promised, the closure which overlays the zipper teeth does seem to be protective. The Very Protective zipper appears to live up to its name. Photo: Paul Kirtley. After a summer in my pocket, I’ll be able to tell you how much, if any of the outdoors found its way inside. I particularly like the easily gripped leather zip-pull as well as the all-metal attachments. I expect this will stand the test of time. A final feature which I think is particularly well thought through is allowing the zip to continue round a short distance beyond the opening where you insert/retrieve your bank cards. 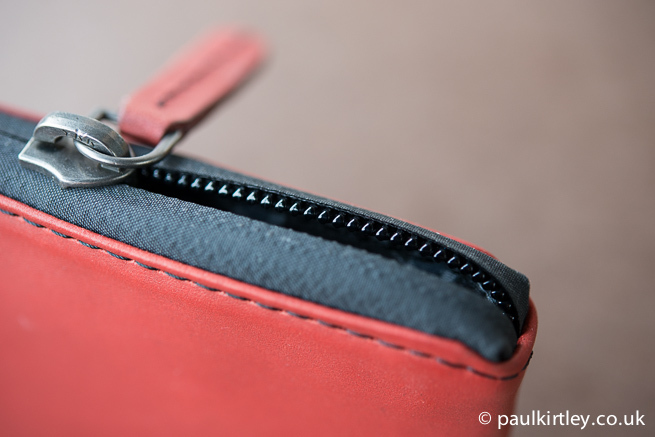 This means the zip-pull is right out of the way and you can open up the end of the wallet without putting strain on the zipper or the wallet lining. Importantly, I was able to decant all of the important items from my old wallet – bank cards, driving licence, bank notes and postage stamps as well as a few loyalty cards – and easily find a space for them in the Bellroy Very Protective. There was no trouble getting the zip closed. There’s certainly room for more in there if I choose to add anything. My Bellroy wallet packed and ready to go – compact and neat. Photo: Paul Kirtley. The closed wallet is half the thickness of my old folding wallet and all I’ve removed from the mix are a couple of dog-eared coffee cards. As a result, it’s more comfy, and lighter, in my pocket. Overall, I like the wallet. It’s a compact, aesthetically pleasing package. There are some well thought-out practical touches and I can fit everything into it that I need to. The wallet itself weighs only 30g (1.06oz). This, combined with its small size certainly means the Bellroy Very Protective fits my criteria for useful yet minimalist organisational items. Disclaimer: The Bellroy Very Protective Wallet was purchased with my own funds. I have received no payment or reimbursement to write this blog and I am under no obligation to say anything other than what I honestly think about the product. I’m sorry, but it has a zip – that makes it a purse. Just received a black one altough your take on the red had me thinking for a minute if i should change it for the signal color. I never lose…… no I’m not going to say it. Did you notice that the interior tab also serves as a sim card or sd card storage? Can I trouble you for the measurements of this wallet?